I never really understood Christmas lights until I moved to New England. I'm not talking about the houses so covered in zillions of tiny bulbs that they can probably be seen from space. That kind of lighting may be remarkable, but it doesn't move me -- and it also doesn't seem to exist out here where I live. I'm talking about simple lights, prosaic lights. Lights twined around trees. Illuminated icicles along the eaves of rural houses and barns. Strings of light limning fences on back roads in the middle of nowhere. I never understood lights like that until I moved to a place where complete darkness can fall by 5pm. Jewish time is closely tied to the cycle of the seasons: the phase of the moon, the angle of the sun. In summertime, it makes sense to daven shacharit (morning prayers) as soon as I can roust myself out of bed; the sun rises around 5am, after all. By the same token, evening prayers fall late in the day; in high summer, it's light until at least nine. Not now. These days, where I live, the sun rises after seven, and sets during the afternoon. Hebrew school begins in the twilight, and when it ends the world is pitch-black. There's a lot of darkness here at this time of year, and that's changed my relationship with Christmas lights in a pretty fundamental way. I'm especially fond of the houses where a single candle is lit in every window, which turns out to be a Scottish yuletide custom, meant to light the way for wayfarers -- or, depending on who you ask, for the Holy Family on Christmas Eve. 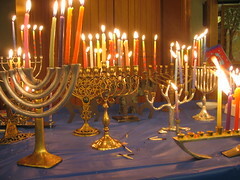 Maybe that practice resonates because Jews place our chanukiyot (Chanukah menorahs) in the windows of our homes, so that the lights we kindle can be seen by all who pass. The prayer Hanerot Hallalu (recited after candle-lighting) is a reminder that we kindle the Chanukah lights solely for their beauty and their mnemonic power, not because we plan to use them for any other purpose. We don't light them to read by, or to play dreidl by. We light them in order to see them, remember, and feel gratitude and awe. They're just there to give light. Obviously Chanukah lights and yule candles have a religious resonance that purely decorative lights don't and can't lay claim to. But the two kinds of light in the darkness feel kin to me in some way, and both make me happy. The religious ones because of the stories they evoke; the secular ones because they're proof that someone out there cares enough about spreading light to take the time to string the cords, replace the bulbs, and illuminate the darkness. They're a gift for everyone who passes by. Sometimes, especially late at night when snow's coming down, they light my way home. And when I drive our dark winter roads during the week of Chanukah, the remembered lights of my chanukiyah gleaming in my mind's eye, the lights on trees and barns and houses feel like they're twinkling in celebration right along with me. 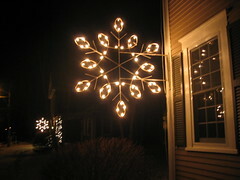 The illuminated snowflakes that line Water Street in Williamstown have six points, in fact, which means if I squint they're almost stars of David. It's all in the eye of the beholder, of course, but at this time of year I'm inclined to find light, on all levels, everywhere I can. Technorati tags: religion, Judaism, lights.